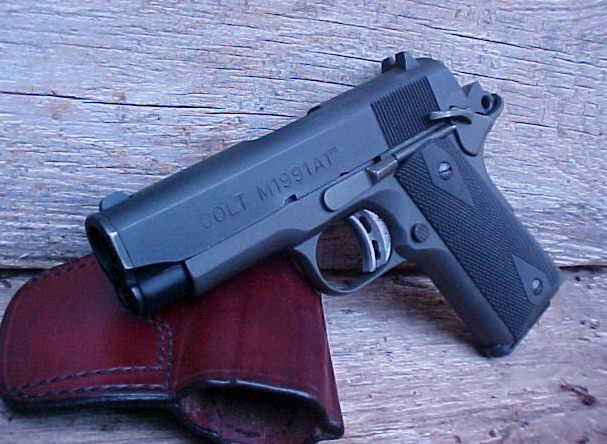 This Colt Compact was a standard black parkerized pistol when I purchased it at a gun show last year. It was in like new condition, and the $400 asking price did not faze me. Since that purchase, this little 1911 underwent a slow but deliberate transformation by my hand. It was already a very accurate little shooter, so I kept the Colt barrel. The trigger was immediately swapped out for a Dlask unit, and a proper trigger job was performed. I installed a plain Ed Brown grip safety and extended thumb safety. The original plastic polymer mainspring housing was traded off for an Ed Brown checkered chunk of steel. A Ted Yost retro rear sight was used. The recess in the original Colt front sight was filled with gold. The big change was made with the addition of a EGW melt bushing along with a Clark Custom reverse recoil plug. 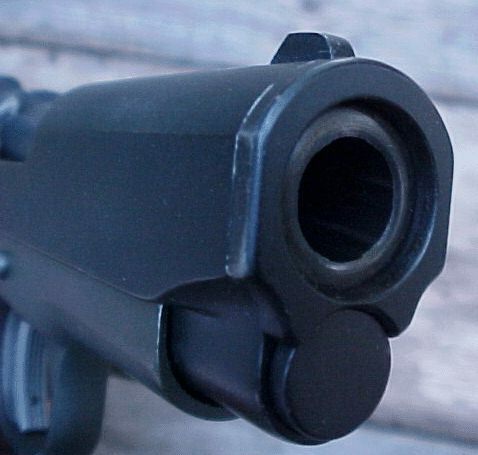 The thin stock bushing is known to crack on Colt Compacts, and the tab retaining the recoil plug has been known to shear off, sending the recoil assembly downrange in a embarrassing display of design inadequacy. The EGW bushing and Clark reverse plug make certain that that will never occur on this pistol. The EGW bushing also protects the barrel crown. Once I had the mechanics of this pistol where I wanted them, I dehorned it, screwed on Pearce double diamond rubber grips, and had a two tone teflon finish applied. I still prefer my Government sized Sistema as a carry gun, but the Compact is a reliable alternative, and a nice option to have when needed. I usually do my own smith work, but I live five miles from Teds shop, and a couple years ago I had him build me up a carry gun based on a Springfield Champion I already owned. One of the best guns I've ever owned. Awesome job with that pistol! It looks good. Got this post bookmarked for the next Ammo Can. Thanks again for the link. Wow! Talk about Value-Added modifications! I think the final result was a beautiful carry gun! +1 for Ammo Can Carnival Post! What you wrote about "the thin stock bushing is known to crack on Colt Compacts," could you point me to an article detailing the problem? I've got a 1991 Compact, and now you've got me a little concerned. Thank you! reports of the cracked bushing are on The 1911 Forum. Youcan also find instances of the recoil assembly launching down range. I actually say a recoil plug shear off it's lug. That made a believer out of me. If this were to be a range gun, no problem, I'd keep the original pieces. For a carry gun though, I wanted the possibility eliminated. I was wondering how you did the gold filling of the front sight? It sounds much more cost-effective than replacing a sight with a new 'gold bead' sight liek from Novak or SDM. Filling a front sight with gold? Don't laugh....I took it to a friend who is a dentist and gave him a fifty dollar bill. 15minutes later, I was done. Hey, X... was wondering how you fitted that bushing? You willing to give up a little info? I have it's twin, and this post has really fired me up. I've done my own 'smithing, but never a bushing. Any help would be appreciated. Looks like some great additions. I've been meaning to look into EGW's melt bushings. Their shop is right next to my favorite local gunstore, so it's a win-win.